For most nationalities, 30-day tourist visas for Laos are available on arrival at airports and most land crossings. At the airports, at least, it’s a straightforward and relatively quick process — fill in a form, provide one passport photo, pay your fee and it’s done — but if you’re travelling through a lesser used border or just like to be prepared, you can organise a visa for Laos in Hanoi. I haven’t travelled from Vietnam into Laos but have bad memories of the crossing from Thailand at Huay Xai — how I wish I’d got a visa in advance! 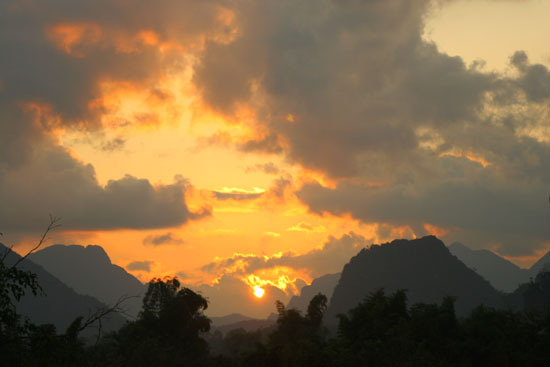 Who can resist the beauty of Laos? The Laos Embassy in Hanoi has a website — http://www.laoembassyhanoi.org.vn/. It doesn’t provide much information, but does list the visa fee for different nationalities and contains a downloadable application form. The fee list is dated 2010 but appears to be still current as of 2014. Best to re-confirm if it’s a deciding factor for you. A full price list is prominently displayed at the Consulate. Note that the Consulate is at a different address to the Embassy on Quang Trung Street in Hai Ba Trung District. The Consulate’s stated opening hours are 08:30-11:30 and 13:00-16:00, Monday to Friday. But I turned up at 11:10 and was told it was closed. Someone else I spoke to said they’d arrived at 13:00 and had to wait around as the staff was back late from lunch. So aim for mid-morning or mid-afternoon to be on the safe side. Prices vary depending on nationality. We were quoted US$45 for Americans, US$42 for Canadians and US$35 for European countries. Pay when you pick up the visa: as a rule they only accept US$ cash but will not refuse VND if that’s all you have — it’ll be converted at 22,000VND / US$. Visas take three days to process but you can pay an extra US$5 for the one day service: apply one day and you can pick it up the next afternoon. Plus you only need to fill in a short form and provide one passport photo and your passport. So all very straightforward.